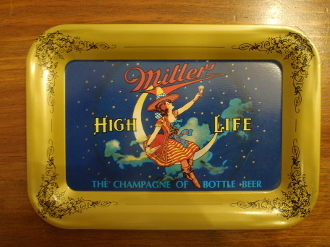 MIller High Life Beer tip tray measuring 6 1/2" x 4 1/2". Miller High Life "The Champagne of Bottle Beer" with toasting maiden. Very nice tray with little handling marks or wear. Is an excellent display tray.